The organisers of Molly’s Bash regrettably have had to make the decision to permanently change the date of Molly’s Bash. The new annual weekend for Molly’s Bash will now be the second weekend in September. Molly's Bash is a major fundraiser for the Old Andado Homestead and a truly unique outback experience. Originally the bash was held to help raise money for the Alice Springs Pioneer's Women's Hall of Fame which Molly Clark founded but now it's to raise money to keep the Old Andado Homestead and the other buildings in good condition. The whole of the Colson Track is not open to 4WD travellers. Currently at this point of time you can travel up the Colson Track from the French Line as far as Madigan's Camp 5. Or you can access the Madigan Line to Camp 5 from Camp 1a and Camp 2, although it is requested that you do not visit Camp 2. Visiting Camps 3 & 4 is prohibited. 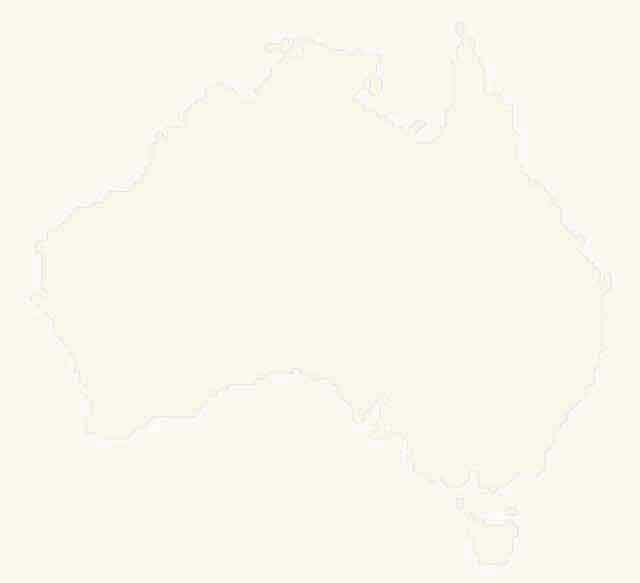 When you apply to the Central Lands Council (www.clc.org.au) for a Simpson Desert Track permit for the Madigan Line a map will be supplied showing you where you are allowed to go. Traditional Owners have also expressed concern with people driving on clay pans. Even in dry weather when they might be shallow or nearly dry, tracks can persist on the clay pans for over 25 years. Not driving on clay pans will probably form part of the amended permit conditions. 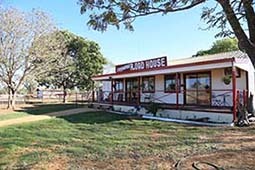 It's getting late to travel the Gulf Road west of Burketown but the Tirranna Springs Roadhouse (ph: 07 4748 5658) is again open for business supplying food, fuel and camping, which is great to see. 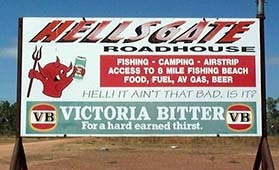 Meanwhile just a little further west, Hells Gate Roadhouse (07 4745 8258) is offering limited food, fuel and camping to travellers on this track. Hells Gate (which is due to be sold) is generally only open from April to late Sep/early October, so if you are travelling before or after those times then give them a ring to check if they are open. Glass has been banned in 15 of the Northern Territory’s most visited waterholes from last July. Signs at each of the designated waterholes will inform visitors of the restricted areas, with Rangers conducting regular patrols to remind people of the new rules. 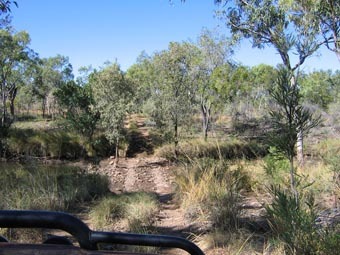 Waterholes include Howard Springs, Litchfield NP, Nitmiluk NP, the waterholes of the West MacDonnell NP and more. 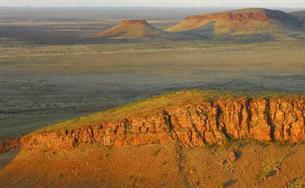 Check the NT parks website for more details - http://www.parksandwildlife.nt.gov.au. The caretakers at the Adelaide River Railway Heritage Precinct in the NT and situated 100km south of Darwin are looking for volunteers. In return for free camping with power, showers and water you can do some clean-up work, etc around the precinct. You would be welcome to stay a few days or a few weeks, help out a little bit and enjoy Adelaide River. For more information on the Precinct and all that it offers the visitor, check out: http://www.enjoy-darwin.com/adelaide-river-railway.html. This remote bush camping spot is situated in the recently proclaimed Newry Fossicking Area and is located 1.1km south of the Victoria Highway and about 12km east of the NT/WA border. Please note that there are no facilities on site and you must contact Newry Station, ph: (08) 91678823, before heading out there. For more info on the camp and the fossicking area visit: http://www.nt.gov.au/d/fossicking/index.cfm?pg=2-9. When you are in Central Australia this year, take time out to visit the Alice Springs Desert Park. You'll be amazed at what secrets our desert country holds and will be enlightened and enthralled by the displays at the park. If you've got kids along they love it, while there's often special programmes to keep the little ones entertained. For more details check out: www.alicespringsdesertpark.com.au. This is a much shorter route from Kununurra in the Kimberley across to the Stuart Highway in the NT via Top Springs. 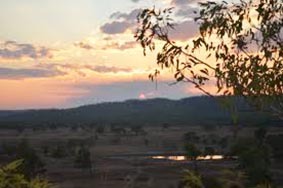 It travels via the impressive Jasper Gorge where bush camping is available and passes the great Victoria River Downs HS. Here you can take a helicopter flight over the surrounding country and it’s well worth doing; There is fuel, accommodation and camping available at Top Springs. Two new IPAs (Indigenous Protected Areas) covering over 20,000sq km have been proclaimed in Arnhem Land. 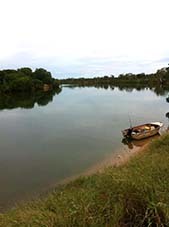 Adjoining Kakadu National Park and stretching to the sea around the north coast community of Manigrida these areas are rich in cultural sites and natural attractions. Jol Flemming runs Direct 4WCD and also leads a number of remote tag-along trips out into remote, rarely visited country in and around the northern edge of the Simpson Desert, much of it through previously inaccessible Aboriginal Land. Linking up routes such as the tracks from Mt Dare in SA through Old Andado to Alice Springs, the Binns Track is the latest four-wheel drive experience for NT visitors looking for a route off the blacktop. Taking seven days or so the adventure finishes in Timber Creek. If you are travelling the Binns Track then check out the Dunmarra Wayside Inn on the Stuart Highway, about 8km south of the intersection of Buchanan and Stuart highways. 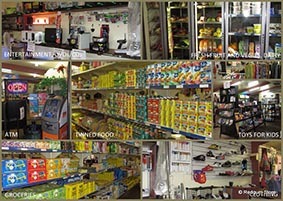 This top roadhouse has cheap and clean motel-style units and campsites, an excellent bistro and bar and fuel supplies. For more information call 08 8975 9922. The Mt Swan store, 40km north of the Plenty Highway, is not always open to supply basic food stuff or fuel, bu the nearby Red Gum Store - just 2km away - is open 7 days! from 9am to 4pm - only closed on 25 and 26 December and on 1st Januarys. And it is well stocked with groceries, and with diesel and ULP for sale, and if you have a flat tyre they just may have a tube or even a tyre that fits your car. At least you may fill it using their air compressor. Just follow the signs from the gate at Mt Swan. For more details, phone 08 8956 9940. 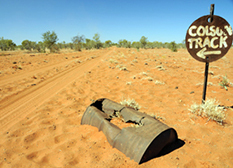 Rabbit Flat Roadhouse, half way along the Tanami Road between Halls Creek and Alice Springs, has closed its doors to passing travellers. There is no longer fuel available. Newhaven Sanctuary is a few hundred kilometres north-west of Alice Springs and was a cattle station acquired some years ago by the Australian Wildlife Conservancy and Birds Australia. There is a great little camping area located here which is nice and shady, and set amongst the mulga. Composting toilets, a hot shower, water taps, fireplaces and wood delivered to your tent or camper each afternoon by the friendly staff, costs just $10 a person/night. For more info check out: www.australianwildlife.org/sanctuaries/newhaven-sanctuary.aspx. Manangoora Station is a pastoral lease of over 1400 sq km located 90km east of Borroloola in the NT. The station has been owned and run by the same family since the 1920s and offers great fishing and a real wilderness camping experience. The campground also has the closest boat ramp access to the Gulf of Carpentaria, Vanderlin Island, the Edward Pellow Islands & Barranyi National Park. Ambalindum Station is a working cattle station situated approximately 135km north-east of Alice Springs and is one of the original properties settled in Central Australia in the early 1900's. The station has a range of accommodation available and a shaded, grassy camping area with powered sites, toilets and shower blocks. 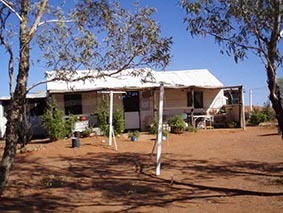 For more details visit: http://oldambalindumhomestead.com.au/accommodation. They also have a Facebook page: https://www.facebook.com/pages/Old-Ambalindum-Homestead/183096745113189. Treat yourself to a very pleasant up-market station stay when you are heading north along the Stuart Highway next. This working 2000ha brahman stud breeding property is located just south of Mataranka, while the family also lease the nearby 50,000ha Numul Numul station. There's 4WD tours and great bird watching and of course you are close to the delights of Mataranka Springs and the Roper River. The Ross River Resort east of Alice Springs got a bit of a hammering earlier this year, especially the camping area, when a bush fire swept through the place. Don't worry though it's already up and running with restoration work happening to bring the campground back up to scratch and it is business as usual elsewhere on the place. Do yourself a favour and visit when you are next in the Centre. For more details, ph: (08) 8956 9711 or visit: http://rossriverresort.com.au/. 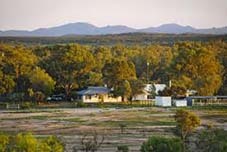 Banyan Farm is a spacious, grassy and shady camping park on the banks of the Daly River and is ideal for those wanting to fish the river for the elusive barra or other fish species. 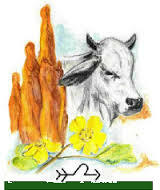 For more info, ph: (08) 8978 2461; www.banyanfarm.com.au. Data and information is provided for informational purposes only, and is not intended for any other commercial or non-commercial purposes. Neither we nor any of our data or content providers shall be liable for any errors or delays in the content, or for any actions taken in reliance thereon. By accessing our web site, a user agrees not to redistribute the information found therein. We provide customised links to select companies for your convenience only. We do not endorse or recommend the services of any company. The company you select is solely responsible for its services to you, the user. We shall not be liable for any damages or costs of any type arising out of or in any way connected with your use of our services.